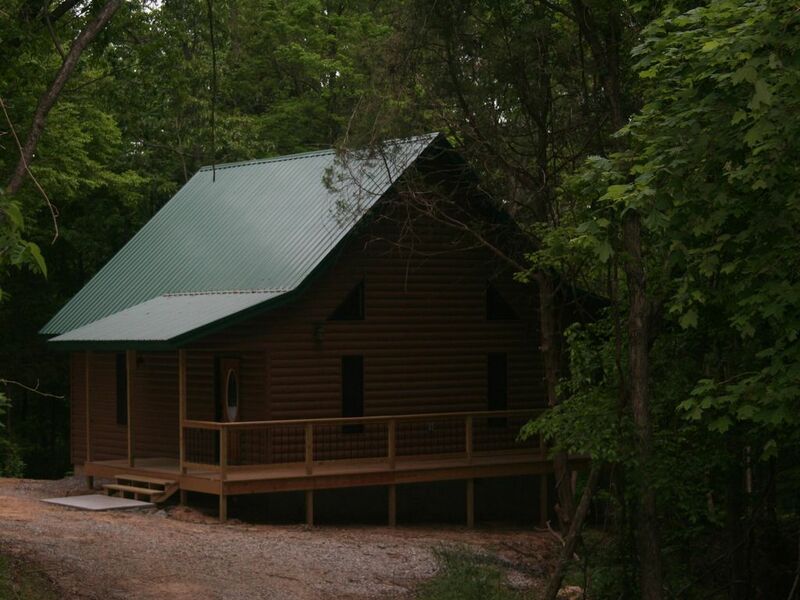 This is a cabin located in the woods of the Shawnee Forest on the Shawnee Wine Trail. Our cabin has 2 bedrooms with one as an upstairs loft. It features a full kitchen with a microwave, stove, and refrigerator. Our cabin also offers satellite TV in every room, and a hot tub. Our cabin is right next to Abby Ridge Brewery and Tap Room where you can taste their variety of beers or treat yourself to some fine dinning. Abby Ridge also offers room service to our cabin. Come and see for yourself what Dutch Ridge Cabins and the surrounding area have to offer. Beautiful area with plenty of forest and rolling hills. Secluded. Perfectly quaint little cabin with all the amenities of modern living. Could not have asked for a more perfect getaway. Stepping into this cabin, you feel “off the grid” yet well within driving distance of all aminities. New but rustic, this cabin has everything you could ask for. I strongly recommend this cabin and would certainly visit again. Absolutely loved the cabin and it's location. Just a hop skip and jump away from the wineries. But also totally secluded, could not see another building from the cabin. The inside was warm and cozy, and just felt calm and relaxing. Definitely would like to come back in the fall for the changing of the colors, the back deck is a perfect place to sit and soak it all in. Great place to stay! The cabin was tastefully decorated (not too country; more contemporary), spacious and secluded. We did not hear any road or neighbor noise. Kitchen was adequately stocked for the simple meals that we prepared. We did not use the television but used the fireplace extensively and it kept the cabin very toasty in late February. The hot tub was spacious and clean but heavy on the chemicals, which would be expected. Bed downstairs was full-size (which we were OK with) and very comfortable. AT&T cell service was spotty at best. We cooked instead of going to restaurants because the kitchen was so nice. Living room area is small but for a couple is cozy and intimate, sitting in front of the gas fireplace. The cabin was close to hiking in the Shawnee forest and wineries. We Can’t say enough nice things about this place. Perfect getaway for our anniversary and the snow was an added bonus! We will definitely be back! Very private location but easy to locate. Directions in the booking were needed since gps did not locate. We were thankful the owner came Saturday morning to blade the driveway but was still a challenge to get out till later in the afternoon with our front wheel drive suv but we made it. My girlfriend and I stayed over the 2019 New Year. The cabin was constructed in the last couple years and is in great condition. Everything was clean and worked perfectly. The location is good for access to wineries as well as the Little Grand Canyon, where we took a hike. Aside from the cabin, the property is secluded enough that you can't see any other buildings, and it didn't feel like anyone else was going to see us unless they made a point of driving up to the cabin, which we appreciate. The back and side deck have great views of the surrounding forest, which I'm sure would be even more beautiful in summer. The only thing that we found a little bothersome was that the kitchen is very sparsely appointed (a few pots and pans and some baking sheets with an assortment of cooking utensils). There are plently of cups/plates/flatware/drinkware, but we like to cook on our trips and would prefer a better equipped kitchen. It didn't diminish the experience, but it's something to be aware of if you plan to cook a lot. Overall, we very much enjoyed the cabin and would stay there again for wine trail trips. Beautiful, secluded cabin. This was just what we were looking for. If you would rather not stay in a cabin that is #4 in a line of a dozen cabins, this is what you want. The place was immaculate and absolutely perfect for a nice, romantic weekend getaway. The kitchen was stocked, all we had to do was stop by the grocery store on our way in to pick up our food and we were all set. The only way this cabin can get better, is with wi-fi and a full size couch instead of a loveseat. We cannot recommend staying here enough. Like I said, we will be returning on our next weekend getaway trip.